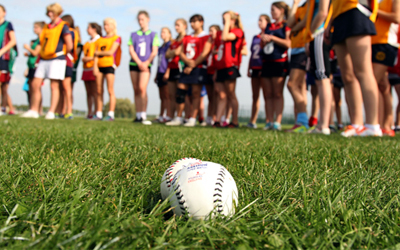 Have you got a new rule to add to the 2020-2022 Official Rounders Rules book? Think you have got an amendment that will make a Rounders rule clearer? Rounders games are played between two teams. Each team has a maximum of 15 players and a minimum of 6 players. No more than 9 players may be on the field at any one time. The bowler bowls the ball to the batter who hits the ball forward on the Rounders Pitch. The batter then runs to as many posts as possible before the fielders return the ball to touch the post the batter is heading for. If the batter reaches the 2nd or 3rd post in one hit, the batting team scores ½ a Rounder. If the batter reaches 4th post in one hit, the batting team scores a Rounder. Games are usually played over 2 innings with the aim of the game to score the most Rounders. Accompanying Scoresheet and Score Key can be downloaded. If a team is mixed, there should be no more than 5 male players. A list of players and substitutes should be submitted to the Umpire prior to play. Players once substituted may return during the game, but batters only in the position of their original number. The batting team should wait in the backward area well away from 4th post. If out, wait in the backward area well away from 1st post. A batter should only enter the batting square when called to do so by the Umpire. The batter will have one good ball bowled to them. Batters can use 2 hands if they wish. Batters can take a no ball and score in the usual way, but once you reach 1st post you cannot return. You cannot be caught out or stumped out at 1st post on a no ball. The ball is not thrown in a smooth underarm action. The ball is above the batters head or below the batters knee. The ball bounces on the way to the batter. The ball is thrown wide or straight at the batters body. The Bowler’s foot is outside the square during the bowling action. If a batter stops at a post, they must keep in contact with the post, with hand or bat. If they don’t, the fielding side can stump the following post to put the batter out. Batters can run on to a post even if it has been previously stumped (you don’t score if the post immediately ahead has been stumped). When the bowler has the ball in the bowling square a batter cannot move on, but if they are between posts they can carry on to the next. There cannot be two batters at a post. The umpire will ask the first to run on when the second makes contact. When at a post, the batter does not have to move on for every ball bowled. Once in contact with the post, a batter may turn the corner over the 2 metre line. Batters can move on as soon as the ball leaves the Bowler’s hand, including no balls. Batters must touch 4th post on getting home. If the batter hits the ball and reaches and touches 4th post before the next ball is bowled, the batting team scores 1 Rounder. If the batter hits a no ball and reaches and touches 4th post before the next ball is bowled, the batting team scores 1 Rounder (you cannot be caught out on a no ball). A ½ Rounder is scored if the batter reaches 4th post without hitting the ball. A ½ Rounder is scored if the batter hits the ball and 2nd or 3rd post is reached and touched before next ball is bowled. However, if you continue this run and are put out before reaching 4th post, the score will be forfeited. A penalty ½ Rounder is scored for an obstruction by a fielder. A penalty ½ Rounder is scored for 2 consecutive no balls to the same batter. A penalty ½ Rounder is scored by the fielding team if waiting batters or batters out obstruct a fielder. A batter can score in the normal way on a backward hit but must remain at 1st post while the ball is in the backward area. The post a batter is running to is stumped. The batter is caught out. A batter overtakes another batter on the track. A batter deliberately drops or throws their bat. The batter misses or hits the ball and their foot is over the front or back line of the batting square. A batter runs inside the posts (unless obstructed). A fielder obstructs a batter. If the batter is ordered to make and maintain contact with the post and refuse to do so. The batter loses contact with the post; When the bowler has the ball and is in the square (except on an over run). During the bowlers action but before they release the ball. All umpires and coaches have a duty to carry out a risk assessment before allowing play. We have provided a standard risk assessment for you. This is a useful document to gain some knowledge of the expectations of undertaking a risk assessment and what you need to be aware of when considering a safe environment to play Rounders in. Rounders England does not recommend participation whilst pregnant due to the significant risk to health. Individuals who do choose to participate whilst pregnant should seek medical consent before participating and must accept responsibility for any adverse consequences of their decision. In a simple format, Rounders can be played with jumpers as bases and a racket and a ball – pretty much how you might have played it in childhood! Competitively, we recommend that approved equipment by Aresson is used. Approved equipment is manufactured for the purpose and meets the specifications set out in the Official Rounders Rules book. All rounders bats should have a grip made for the purpose. Wooden – The surface of the bat should be kept smooth and free from splinters and dirt. When spliced, the joint and any binding should be tight, firm and secure. Aluminium – Caps and grips should be well fitted and not allowed to become loose. Plastic – The surface of the bat should be smooth. Posts must be fitted with a safety cap. They must be supported by a rubber-like base and not fixed to the ground. Wooden posts should be sheathed in plastic. White or coloured rounders balls are allowed and should be considered when assessing the playing conditions. All stitching should be flush to the outer covering with no raised seams. Stitching should be uniform, tight and unfrayed. The outer covering should be free from tears and projections. The ball should be kept clean and free from dirt. Wet balls that weigh heavier than the rule specifications should not be used. During play rounders bats and balls should be kept dry to ensure that a firm grip can be maintained. After play, wet equipment should be dried out slowly and stored in a dry place. A light oiling with linseed oil will minimise the cracking of wooden equipment; care should be taken to avoid oiling the handle of the bat. All clothing must be suitable for the purpose. Most sports kit is acceptable. When a team has been formed for a while, it is common to wear a uniform kit. Approved kit by iPROSPORTS is recommended; high performance kit that can be custom-printed. Spiked footwear, i.e. running spikes, is prohibited. It is recommended that football boots (with studs meeting the rule requirements) or astro shoes are worn in wet weather. Protective items for example mouth guards, close fitting shin pads and unpadded, fingerless gloves are allowed. The official marking plan for a Rounders Pitch. The first rule of Rounders is to know the rules of Rounders! 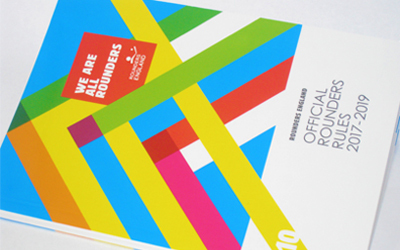 The latest edition of the Official Rounders Rules is a must-have for everyone involved in the game.